Picking a wedding menu can be so hard. You definitely want to use it to continue your theme, you want it to have guest-friendly foods (not all meat, nothing dripping in sauce), and you want your cocktail hour menu to be memorable because that's when your guests are really going to fill up. You also want an action station. I talked to a lot of people before deciding on our final menu (although not any of our guests, just people in passing and in #BridalBabble) and everyone said have an action station. An action station, basically, is a station that is manned by a chef. Items are made to order, while your guest is waiting for it. Action stations -- which can be pasta stations, carving stations, a mashed potato bar, etc. -- always require some sort of interaction between the chef and guest. It's also in addition to your menu and costs extra per person, plus an additional cost for the server. When we went for our tasting, we were able to pick a trio of items off the menu, so I picked shrimp and grits. It would be an action station if we decided on it and would add just over $10 a person, plus an additional server cost. We had options for other actions stations (pasta and carving), but those have been overdone. I've seen them at tons of weddings and always skipped them. But shrimp and grits? 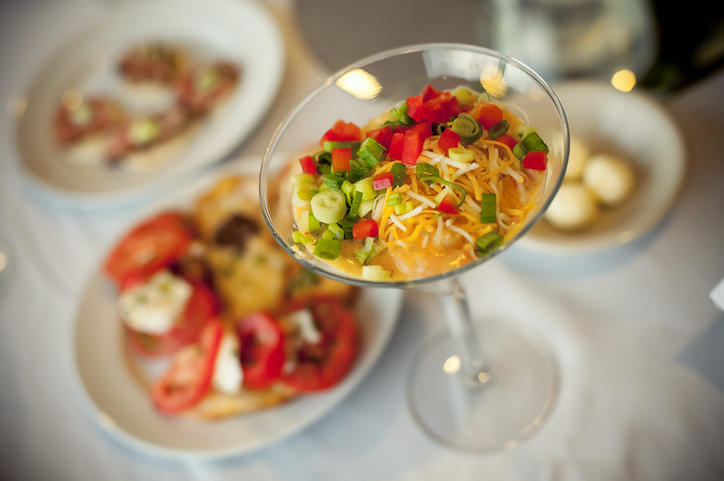 It is so Southern, and since the majority of our guests (more than 90%) are from up north and had never tried shrimp and grits, it was the best choice. No matter how much people told me they loved the interaction of an action station, I wasn't paying all that extra money for something that tasted bad. And I wasn't paying all that for something we didn't taste ahead of time. It was amazing. Absolutely amazing. My mom, who was a shrimp and grits virgin until the tasting, said we had to get it. I called my dad after the tasting and he is not a seafood person but he said he would try it at the wedding. I had never heard of so many New Yorkers eating and enjoying grits (I mean, honestly, that scene from My Cousin Vinny is incredibly accurate). But it was presented in such an inviting way. 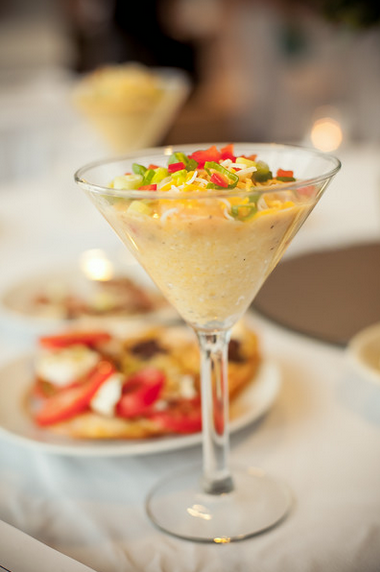 The chef served the shrimp and grits in a martini glass and the guests were able to choose toppings (cheese, green onions, red pepper) to vary the heat. I don't know anyone at the wedding who wasn't intrigued by the presentation and who didn't have a serving (or two). And everyone I saw after talked about it. It was a hit and well worth the extra money. So if your venue has the option of an action station, go for it. Cheese and crackers is great (and we actually did have that too), but no one talks about cheese and crackers the day after the wedding. BRIDAL BABBLE: What do you think of action stations? Action stations are very nice but couples should always remember that a line can form waiting for the chef. With this in mind, the best placement of the station is always important. I'm a northerner and I love grits! Great point Tanza Cooper. Action stations are fun but can get a little crazy if you have 150+ guests and are not placed appropriately. Great pictures Lisa- I'm now wanting some shrimp and grits. this sounds very interesting & would love to try this!! sounds like it was a hit!